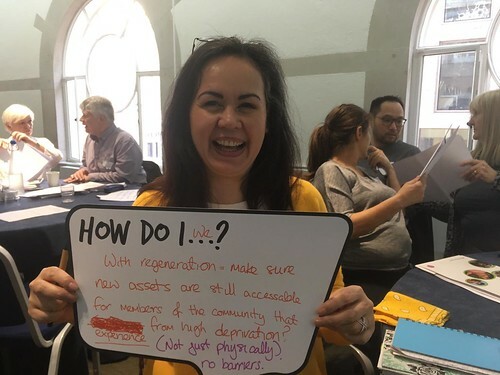 Enabling local residents to make positive changes in their lives is a key part of the vision and action plan in Beechwood, Ballantyne and Bidston Big Local. 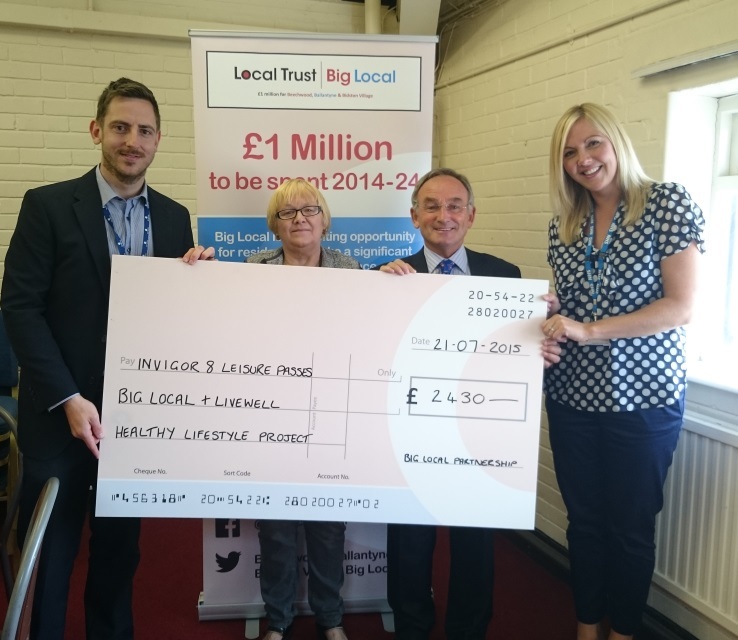 To achieve this goal, the Big Local partnership are developing a series of health and wellbeing initiatives that they will invest in and monitor over the coming years. Under the broad aim of improving health and wellbeing and reducing isolation for adults and older people in the area, we carried out local research and consultations to help us to shape the specific priorities for the first year of the programme. A key priority that we identified was to run an initiative designed to enable adults and older people in the area to become more active and to live healthier lives. The Healthy Lifestyle Project is the product of this. It was a straightforward project proposal: we wanted to purchase leisure centre passes and offer them free to local residents who undertake a full NHS healthcheck. Wirral Council’s director of leisure services was really supportive. We bought 27 ‘Invigor8’ Plus leisure passes from Wirral Council at a 20% reduced rate that we negotiated. These provide four months of free access to a range of facilities and services including swimming, golf, tennis and fitness suites, enabling residents to kick-start a healthier lifestyle to help create a lasting change. We then asked the NHS ‘Livewell’ team to allocate the passes to adults aged 18 and over who live in the Big Local area and who complete a full NHS Livewell healthcheck. At each healthcheck, a health action plan is agreed and recipients are monitored and offered further support and advice to help them keep to the agreed goals. In doing this work, the NHS Livewell team offered a programme that they are already funded to do. I also negotiated room hire within the leisure centre for the weekly healthchecks at no cost to our Big Local. So there has been no cost apart from the passes. All 27 passes were distributed in record time, allocated on a first-come, first served basis. The first healthcheck appointment was taken within three minutes of the project being launched. The passes have been distributed to a wide age range of adults. Those who have taken up the passes include adults with long-term health condition and those registered as physically disabled, as well as people with a wide variety of employment statuses. The vast majority of the passes are being used in line with recognised normal usage levels, and some well above this average. In most cases, people are using Beechwood Recreation Centre as the place to use the passes (this is the Recreation Centre based in the Big Local area). The NHS Livewell team and myself were inundated with calls for such a programme from residents outside the Big Local area. For the NHS Livewell team, it was already a priority to increase their provision in our area. The Big Local Healthy Lifestyle Project is helping them to attract more people to use their services. For the council, the benefit apart from supporting health in their area is that they now have more data on what local people need. Information on the usage of the free passes will support their internal conversation on if leisure costs are at the right level. 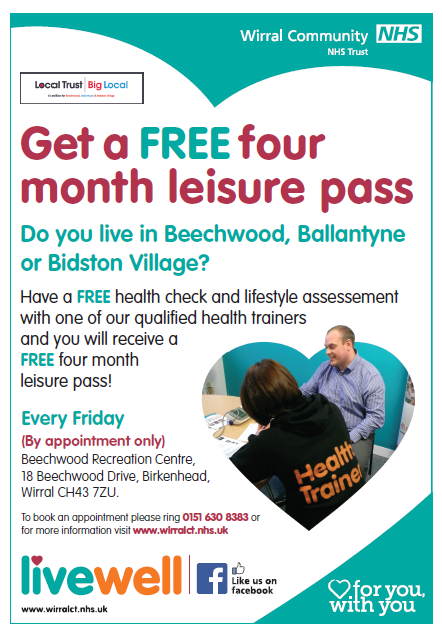 For the residents who have taken part, they have had benefits from the healthchecks and from the leisure passes. In the healthchecks, residents go through a plan of how to use the leisure pass to make healthy lifestyle changes. Where needed they also get the opportunity of referral to additional support, such as smoking cessation, which they would have had to proactively seek otherwise. Without the health trainers being there for the consultations, it would have been some distance for residents to meet with a health trainer, but more people have accessed them now. And we’ve moved the cost barrier issue out the door for the leisure passes. It has been a great start to year one of the programme and the Healthy Lifestyle Project is something that we will consider continuing in year two. The current version is aimed at adults and we are considering extending the age range in a junior version. The project appeared in local press and the Wirral council website. Click here to view the findings of Local Trust's roundtable debate about collaboration between communities and public services.